As of late, it feels like our evenings only start after the baby finally goes to bed. It’s the time when I pour myself a glass of wine and more frequently, start to think about dinner. Some nights I’ve thought ahead while other nights are a ‘throw something together at 9pm’ kind of night. This salad is for those nights. It’s not heavy, can be ready in 10 minutes, and is flavorful enough that I feel satisfied after eating. 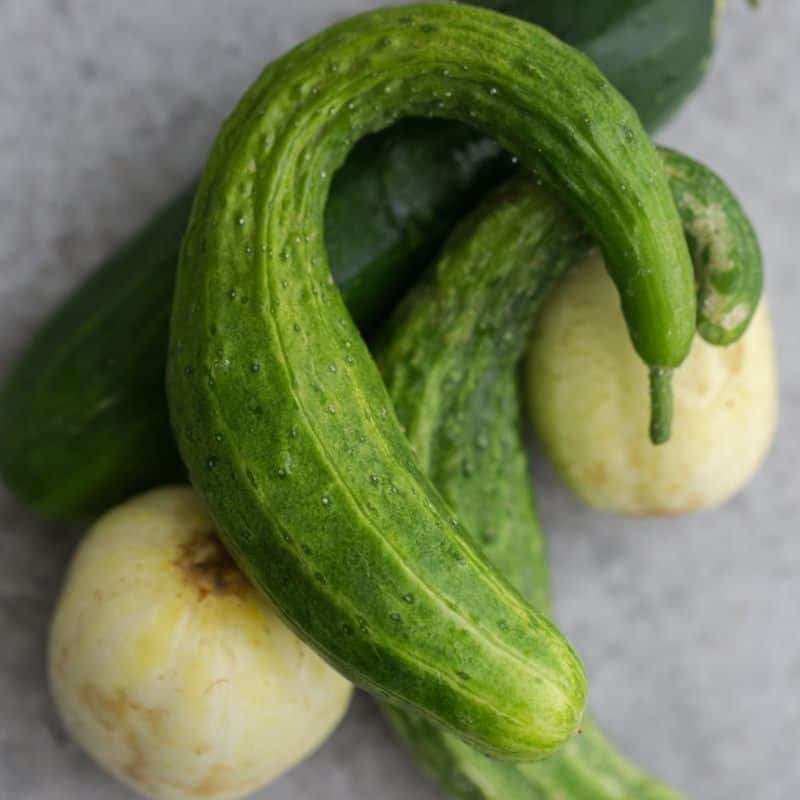 I prefer using English Cucumbers in this recipe because of the low amount of seeds and the slightly sweeter flavor but any variety of cucumber will work. 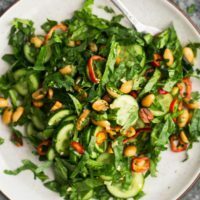 This peanut salad is a wonderful way to use up fresh summer cucumbers in a slightly non-traditional salad. Heat a skillet over medium-low heat. Add the oil followed by the peanuts and toast until warm and starting to toast, 1 to 2 minutes. Be sure to shake the pan often. Add in the minced garlic and cook for a minute more. Remove from heat and let cool. Cut the cucumbers into bite-sized circles or half-moons. Add to a bowl along with the peppers, cilantro, parsley, and spinach. Add in the slightly cooled peanuts. Whisk together the ingredients for the dressing, pour over the salad, and toss until well combined. Serve immediately. Tips and Tricks: If desired, you could turn this into a cucumber-only salad and leave out the spinach. 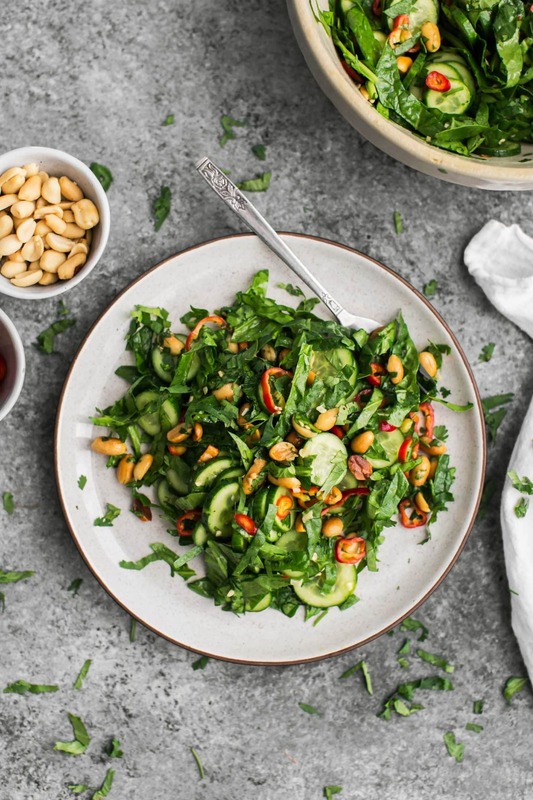 I usually opt to make a salad like this vegan by not using honey but in this particular instance, the just-there honey undertone is missed in the instances I didn’t use it. However, if you’re wanting to make this vegan, I recommend brown rice syrup to replace the honey. Greens: Any salad greens would work in this peanut salad. At first I didn’t add greens but I liked the slight bulk they brought to the salad. Spice: I have a slight addiction to adding sambal oelek to everything right now. Try adding a 1/2 teaspoon or so of the chili paste to the dressing before tossing with the salad. 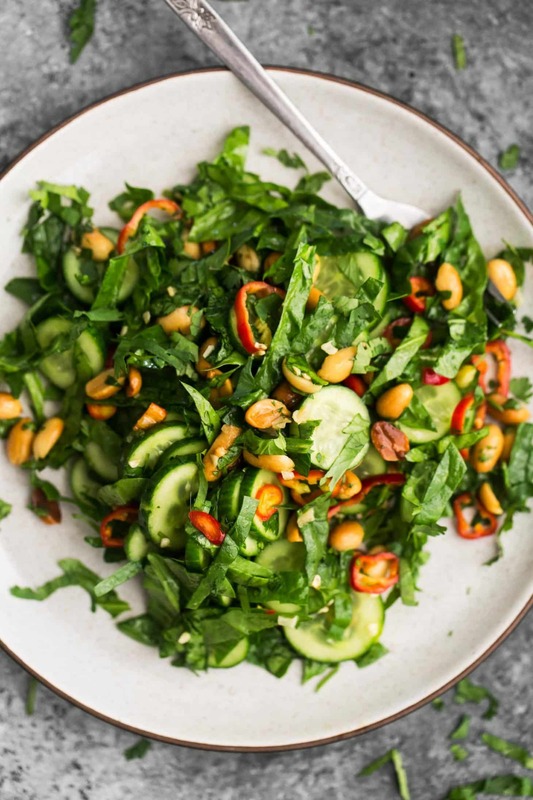 Nuts: This salad can also be lovely using sesame seeds/sesame oil or even sunflower seeds/sunflower oil. 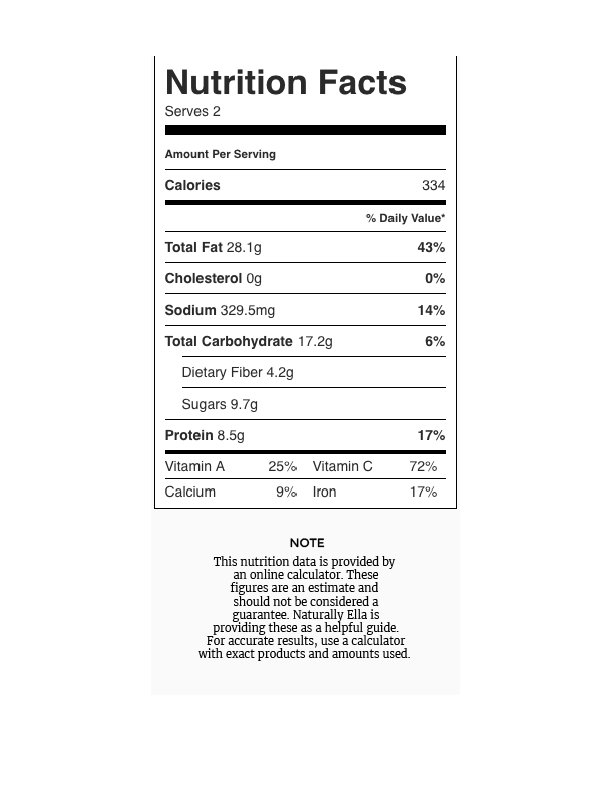 The flavors will be slightly different but the overall dish still works. but your cucumber concoction seems even better to me! This sounds delicious! Can’t wait to try it. I’m so glad I’m not the only mom who is eating supper after 9pm once baby is sleeping. I always feel like I’m failing in the mom department because we should set good eating examples for my babe and eat earlier so he can be at the table to watch. Thank you for sharing.